When it rains, it pours. Jillian just experienced the greatest loss of her life. How will she survive? As her family and friends gather to support her, she finds her loved ones are dealing with situations of their own. When Alison confesses some sad news, will it interfere with Tommy and Maria’s plans? Faced with another big decision for their future, will Marty and Michael make the right choice this time? How will the usually “in control” Carol handle her unresolved issues from the past? Will Ricardo finally be able to shed his insecurities after all the pain of his younger years? Are Grace’s plans to marry based on true love, or is her “ticking clock” forcing her to settle for less than she deserves? And when John Anthony is offered the opportunity of a lifetime, will accepting it jeopardize his beautiful family? Life is full of love and loss. Find out how the characters of the Noted! 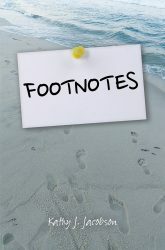 series deal with both in Footnotes, the fifth book of the Noted! series.